Landmark clinical trial validates efficacy of treatment for genetically caused emphysema. A landmark clinical study from researchers at the Toronto Western Hospital provides convincing evidence that a frequently overlooked therapy for genetically-caused emphysema is effective at slowing the progression of the disease. The team explain that Alpha-1 Antitrypsin deficiency is an inherited disorder that can cause emphysema even without exposure to tobacco smoke. Alpha-1 antitrypsin (AAT) is a protein made in the liver that protects the lungs. With this disorder, the AAT protein builds up in liver cells and doesn’t reach the lungs to protect them. According to the Canadian Medical Association Journal, up to five per cent of people with chronic obstructive pulmonary disease (COPD) are thought to have alpha-1 antitrypsin deficiency, yet only four to five per cent of those with a deficiency have been identified. Even when the deficiency is diagnosed, there has typically been a delay of five to 10 years before this specific genetic problem has been identified as the cause of respiratory problems. As described in previous studies augmentation therapy involves regular infusions of purified AAT protein to raise the level of the protein in the blood and lungs. Although the therapy has been available for more than 25 years, it has seen limited use because doctors have been unsure that it works. By using CT scans to measure the lung density of patients in the trial, the researchers were able to overcome some of the challenges that have been associated with studying the effectiveness of the treatment. The researchers state that this treatment has now been studied in their centre using the most sensitive measure of lung structure, a radiologic measurement of lung density, allowing them to detect changes far earlier than can be seen with standard breathing tests. The data findings show that it can now be stated with certainty that augmentation therapy is effective and should be given to patients with emphysema caused by this deficiency. The study is published in the journal The Lancet. The team state that the current study will change how clinicians understand this treatment and encourage them to consider its early use before the condition causes severe emphysema. The team state that as the results show that augmentation therapy preserves lung structure, it also likely adds years of life. They go on to stress that patients with this condition need access to timely diagnosis and treatments to ensure they receive the best possible care. They also stress that this treatment is used only for this specific type of emphysema and is not of benefit to those with more common types of emphysema, chronic bronchitis or COPD. 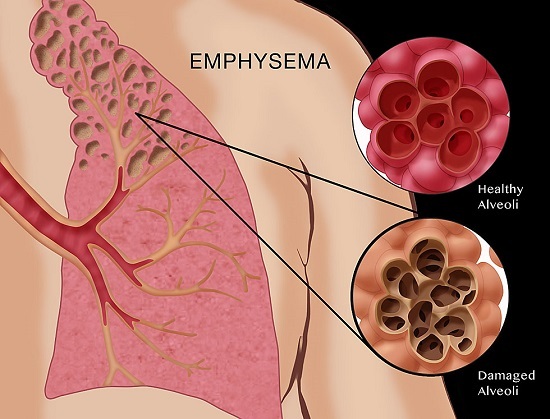 Illustration depicting emphysema, a condition characterized by damage to the alveoli. Alveoli are the small air sacs at the end of the respiratory tree (in the lungs). Long term exposure to compounds found in cigarette smoke (such as carbon monoxide and cyanide) are believed to be responsible for loss of elasticity in the alveoli, leading to emphysema and other lung diseases such as COPD (chronic obstructive pulmonary disease). The illustration also includes the appearance of healthy alveoli for comparison.